My dad taught me how to throw a ball, ride a bike, and use an iron. He took me to my first baseball game, and coached my softball teams and went to my track meets. He helped me move into my dorm in college and helped me negotiate the price of my first car. He made me feel safe. He helped me appreciate music and taught me to sing in harmony. He visited me in the hospital, and rigged the radio so I could hear football games. He drove 45 miles in 30 minutes so he and my mom could get to the hospital before their granddaughter was born. He went with Mike when Maddie was transferred to a different hospital. He supported my husband when he was told Maddie wasn’t going to survive. He painted Maddie’s nursery and helped hang her albums. He makes Maddie smile whenever she sees him. He loves her to pieces and she loves him. Mike is Maddie’s favorite person in the whole world. He can’t wait to teach her how to throw a ball and ride a bike. He doesn’t know how to iron, but that’s okay. He took her to her first baseball game and explained the rules and strategies of the pastime. He sings her songs and changes her diaper and does it with a smile. He makes Maddie laugh harder than anyone else can. He has already started explaining guitar chords and Woody Allen and The Blues. He’s been taking care of her since I was pregnant. 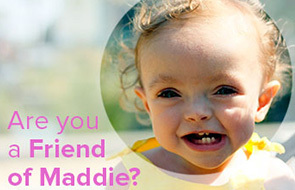 When the doctors told him Maddie was going to die, he told them to keep fighting. He took care of me when I was on bed rest and held me when I was so scared I couldn’t breathe. He makes us feel safe. He takes Rigby outside every morning and night so I don’t have to. He is too good for me. He makes me laugh harder than anyone else. He’ll do anything to make us happy. Maddie, Rigby and I love him more than anything. Happy Father’s day to the two best men I know. I love you. Shiloh Ain't Got Nuthin' On Maddie!Shiloh Ain't Got Nuthin' On Maddie! You and Maddie are very lucky women to have such wonderful men in your lives – happy father’s day to them both. Or should we make that half-jealous, because my daddy is pretty great too. Have I mentioned how hormonal I am? BECAUSE I AM WEEPING COPIOUSLY NOW. Happy Father’s Day to your two favorite men. Oh dear our screen needs windscreen wipers. Dads are so important. It’s a shame some guys don’t realise that. Aw-love this holiday! Congrats on having such great guys in your life! I pink puffy heart this post!